You have to buy a graphics card now and can't find a GeForce GTX 1070 in stock. You already own a GeForce GTX 980 Ti and want to add a second (or third) for SLI. You need the additional CUDA cores, as might be the case in a workstation setup using consumer cards. Everyone else is better off waiting for stores to receive stock of the GeForce GTX 1070. 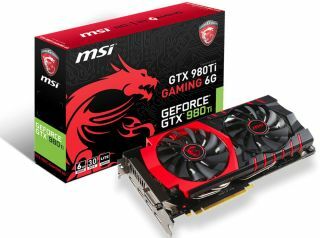 Nvidia and its partners also cut pricing on the GeForce GTX 980 and GeForce GTX 970. The GeForce GTX 980 now starts at around $380 on Newegg, or $370 after rebate, but it's also a bad deal compared to the GeForce GTX 1070. As for the GeForce GTX 970, it can be had for as low as $240, or $220 after rebate, along with several options under $280. It meets the requirements for VR gaming and isn't cannibalized by Pascal (not yet, anyway), though it's worth pointing out that AMD recently announced its first Polaris card, the Radeon RX 480 for $199. That one will launch to retail on June 29 and is likely to be a hot seller.